Joe & Kris Acoustic Duo — Available for Ceremonies, Cocktail Hour, Parties, and more! We can’t say enough good things about Joe and Kris. My husband and I got married on Friday. We had Joe and Kris sing at our Mass and cocktail hour. They were amazing! They were so helpful with helping us with our song selections and even learned new songs that were important to our family. Their voices sounded incredible. They even got an ovation during Mass! Never seen that happen before but there talent was just so incredible. So many people commented on their voices, especially when they sang “The Prayer”. They also did a lot of extra things to keep my nerves at ease and to make sure the Mass ran smoothly. They had us pick all our songs from a big selection of songs and even learned some of our favorites that weren’t on the list. Having them there made cocktail hour!!!! It was perfect. Everyone was commenting on how good they were. Sean and I love live music and were so happy to have them there. Our phones were flooded with texts about them the next day. I can’t say enough good things about them! Their kindness, excitement, and quick responses (especially in panic moments of organization) meant so much to us! Can’t wait to listen to them again soon!!! "Joe and Kris played at my wedding in Manhattan this December. They were the perfect addition to the cocktail hour. They were early to set up, didn't take up much space and they are a delight to listen and watch. They are an adorable married couple and I loved their energy at my wedding. They are two young people in love singing love songs... what could be bad!!!! Joe and Kris sent me all of their songs before hand and had me pick out which ones I liked and played my whole list. I even asked them to learn a song and they did. I would highly recommend them to anyone looking for live entertainment on their big day." 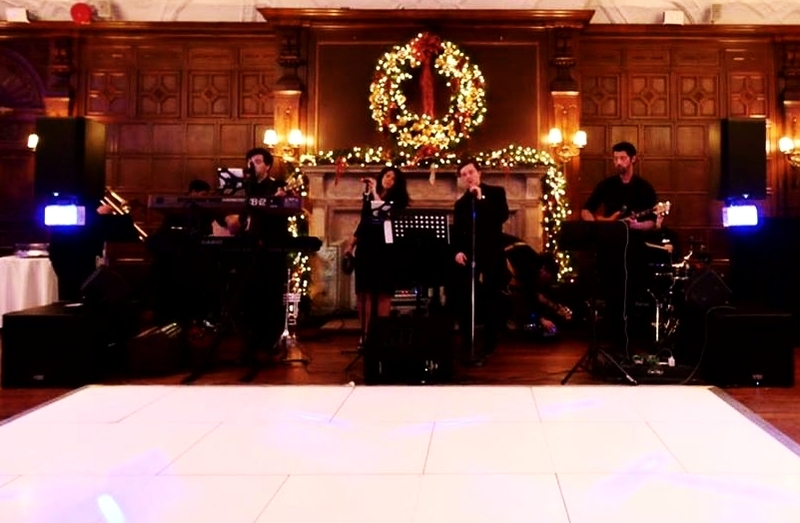 "Joe and Kris provided absolutely everything we were looking for in a band for our wedding party! From a more relaxed and instrumental start to full blown cover party band for dancing and singing along to, Joe, Kris and the rest of the band made our party an absolute blast! From the start, Joe was very professional, responsive and easy to work with. Initially, I was afraid we’d have to skimp on sound in order to accommodate our small venue; but after expressing this Joe, he ensured the right combination of musicians to fit the tight space. Joe and Kris came with three additional musicians and delivered on that promise without compromising sound or energy. Musically, I really could not have asked for more. Not only did the band sound wonderful, but they played to the crowd perfectly, took requests and even learned a few new songs for us. For days after our party, friends and family were telling me how much they loved the band! My husband and I can’t say a big enough thanks to Joe, Kris and the rest of the band for helping to make our wedding party so so so much fun! From start to finish they were the best!" Joe & Kris - Five Stars of Perfection! "My husband & I hired Joe & Kris 4-weeks before our wedding date. We were in a bind as our friend who was supposed to play at our wedding became ill. We did a Google search for "NYC wedding cover bands that play oldie love songs" & Joe Kris appeared on search engine GigSalad which I have never heard of before. The story begins with our love for Joe & Kris! It can be anxiety filled for a bride 4-weeks away from her wedding to not have a band, especially when your fiancé is a musician & music is then ultimately the most important component to the wedding. Music sets the proper atmosphere for the event, as well as display the union in a style that most represents the couple now & for the years to come. Not to mention reaching out to a band via the Internet & on a website you have never heard of before. JoeKris Communicate. Upon reaching out to Joe & Kris we were quickly set at ease. They were the first band we approached & the first band that responded. In fact, we received instant responses for as little or as large of a question we had. This made the process smooth, easy & stress-free. Communication is key when booking online (or in-person!) & there was definitely no lack of communication with this team! We were able to exchange personal e-mails & cell phone numbers in order to accomplish quicker response rates & phone calls as a way to get to know each other, our style & the flow of our wedding to perfection. JoeKris are Experts. They are experts in assembly. They can arrange as large as a 7-piece band or as small as a 4-piece band. Possibly even a 2-piece duet upon request! We secured their talents as a 4-piece band, as we were looking for an acoustic sound & wanted to utilize simply Joe & Kris's voices, as well as their beautiful violin / bass player & extremely talented drummer. The band arrived on-time & set up / load out was seamless. We had requested to keep assembly small as our venue was small & everything fit perfectly! They are experts in their talent - they are extremely gifted in voice, musical ability & range. Every guest loved them & I have sent several guests to their website. Their playlist is extensive & ever changing. If there is a song they do not know, they will work hard in order to learn it before your event! JoeKris are Adaptable. The band was able to learn new songs for our dream playlist. With as little as 1-week away for a newly requested song - none was a problem for this team! Day of the event - we changed the flow of the playlist. They were eager & excited to do it & were completely on the same page as us. JoeKris are Professional. Between Communication, Talent, Assembly, Appearance, Flexibility & Value there is no lack of professionalism here. One thing I had not discussed with the band was dress code! My fiancé & I had wanted the band to wear black. Without discussing, the band, of course, arrived in black & looked beautiful & professional! JoeKris provide extreme Value. As mentioned, my husband is a musician. Music to him was the most important piece of our wedding. Joe & Kris nailed it in every way possible. We feel truly represented as a couple & our union together. Coming from a musician this is not to be taken lightly! Their rates are extremely affordable & you get more from them then what you pay for. Joe & Kris were in the middle of planning their own wedding 4-weeks away from our wedding! To have a couple so in love, singing love songs as a duet, is truly something unique & special to be a part of. Our guests loved this bit of information! Moving forward, we have requested to be invited to public appearances of Joe & Kris & will for sure be using them again. Our experience was amazing & we highly recommend Joe & Kris. We cannot thank them enough for being a part of our special day & for their love & light instilled for us on our wedding day. We wish them love & light on their wedding day & hope they are equally as lucky as we felt we were on our day. "I hired Kris and Joe for my wedding ceremony and cocktail hour on 11-21-15. From the moment I reached out to them I knew they were the one. Joe and Kris were very professional and always answered any emails or texts very quickly. I had requested to walk down the aisle to a cover of I Choose You by Sara Barielles. Boy did they deliver! The song was everything I wanted and more. My guests were amazed by the live music and the variety of music that these two were playing. If you're looking for a duo/band that is professional, friendly, and can play just about anything, then Kris and Joe are definitely for you. Happy hunting." Amazing Band!! Will hire again in the future! "Amazing job! We were a little hesitant hiring a band online, but we were blown away at their complete professionalism! All four band members arrived on time and quickly set up so they could begin playing at the exact time we discussed. They knew exactly what to play to set a upbeat, fun mood for our event, playing everything from 80s to today's hits! Our guests loved them and they really made the event! If there ever comes a time where we'll need to hire a band, Joe Kris Music will be our first choice!"